It's hard to deny that The Wonder Years are the biggest up and coming band in the pop punk scene. Over a couple years the band has went from playing small clubs to House of Blues and eventually to main stage Warped Tour. After releasing The Upsides and the fantastic follow-up Suburbia I've Given You All And Now I'm Nothing, The Wonder Years are on the fast track to become the next New Found Glory. The band's most recent catalog is nothing to scoff at. The Upsides thrust The Wonder Years into the mainstream, landing them spots on tours with the likes of Four Year Strong. After Suburbia, the band jumped on tours with the legends of New Found Glory and The Early November. The band plays a style of pop-punk that incorporates just about everything: Saves The Day, Taking Back Sunday, The Get Up Kids, and even folk rock like The Mountain Goats. Catchy choruses, heavy-hitting guitar riffs, and in-your-face drum beats lay the framework that vocalist Dan “Soupy” Campbell spills his honest lyrics on. The band is set to release their newest album, The Greatest Generation, on May 14th. The newly premiered track “Passing Through A Screen Door” feels like The Upsides with the top-notch musicianship of Suburbia, but with a maturity that first peeked out of the single “Me Vs. The Highway.” The lyrical content is deep and personal, but wholly relatable as themes of aging, having children, and settling down pivot throughout the three-and-a half minute track. Though it may not show the progression many fans may have expected, it acts as a perfect segue between Suburbia and the new album and offers a familiar sound, perfected. Fans of The Wonder Years won't be disappointed, and it's easily one of the band's bands tracks. The honest and relatable lyrics, coupled with spot-on musicianship, make the band a vital piece in the modern day scene. 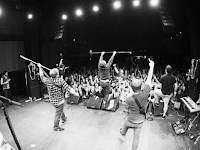 The pop-punk “revival” of recent years with bands such as Man Overboard, Transit, and Fireworks has been picking up steam as The Wonder Years carry the torch. The band is currently on tour with Fireworks, Hostage Calm, and Misser. If you haven't heard the new track, hop over to Absolutepunk.net and check out the stream. You can also preorder the album here.